The term Sciatica is the word commonly used to refer to pain, tingling, numbness, or weakness in the leg caused by compression or an injury to the sciatic nerve, located in the back of the leg. 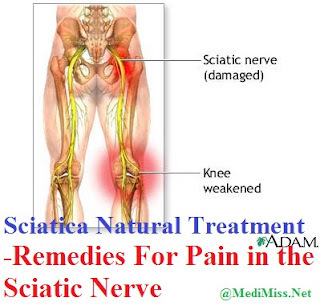 People who suffer from severe Sciatica definitely know the meaning of the word "pain". Sciatica pain can vary widely, ranging from a mild tingling or burning sensation to severe discomfort resulting in the inability to move. Some of the causes of Sciatica include pelvic injuries, degenerative discs, slipped discs, spinal stenosis, piriformis syndrome, sacroiliac joint dysfunction, or even pregnancy. Pain from Sciatica often starts out slowly and gets worse after standing or sitting for long periods of time. For most people, the pain is on one side or the other and can extend from the hip to the sole of the foot. The affected leg may also feel weak. Treatment options for Sciatica can range from mild physical therapy exercises to injections around the nerve. Steroids are also commonly used to treat nerve inflammation related to herniated discs (usually only providing temporary relief). Millions of people suffer from Sciatica in one degree or another, and many of them spend thousands upon thousands of dollars each year on treatments that do not even offer permanent relief, such as steroid injections. Even though there are all natural solutions available for Sciatica that do not require the use of synthetic drugs or surgery. People with this condition should continue to stay active, as becoming more and more sendentary will only make the back pain worse. Gentle stretching exercises such as yoga could be of great benefit. In addition, hanging upside down on an inversion table can do wonders to help stretch out the spine and reverse gravity. Just remember, having sciatica does not mean that surgery and streroids are inevitable. There are always natural steps you can take to ease the condition.